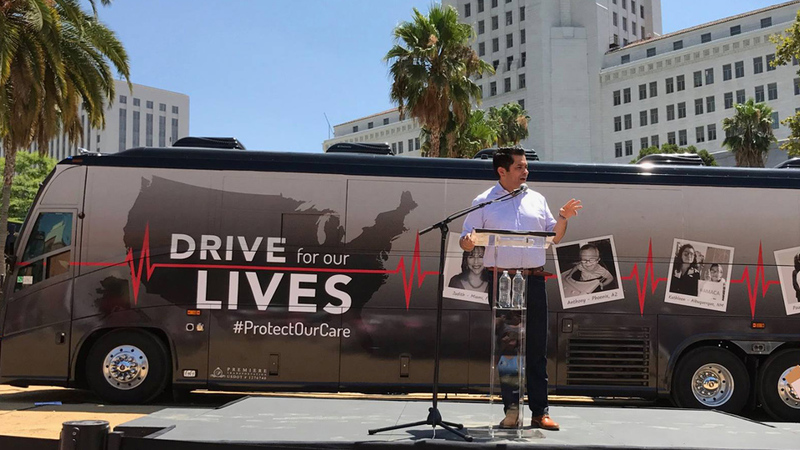 Representative Jimmy Gomez, speaks at the “Drive for Our Lives” bus stop in Los Angeles, July 29. | Save My Care Facebook page. American Federation of Teachers President Randi Weingarten will join a nationwide bus tour, traveling from the West Coast towards D.C., backing the Affordable Care Act (ACA) and retaining its guarantees of health care for millions of people, organizers of the tour announced. The tour is absolutely necessary, organizers said, to keep the pressure on lawmakers during the August congressional recess. The object: To keep the ACA and drop all attempts by Congress’ ruling Republicans to “repeal and replace” it, or, more likely, just repeal it. 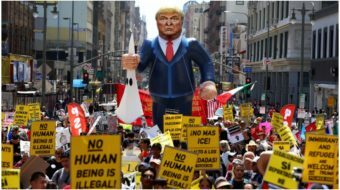 It follows mass protests on July 29 in 125 cities, demanding Congress keep the ACA. 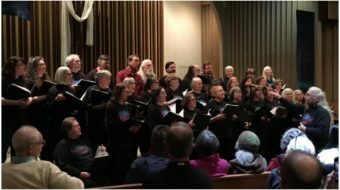 In Dayton, Ohio, for example, Montgomery County Commissioner Debbie Lieberman, Dr. Donald Nguyen of Doctors for America, and noted local pastor John Ridley joined hundreds of local health care advocates and residents “to stand against the efforts to repeal to the Affordable Care Act,” local TV news reported. Leaders of the “Drive For Our Lives” bus tour intend to mimic the pressure radical right tea partyites brought upon lawmakers in 2009. But bus tour organizers say their participants will be insistent, not impolite. Their bus will tour through 20 states, including California, Arizona, Nevada, Colorado, Pennsylvania, Ohio, Iowa, Maine, Kentucky and Wisconsin — to meet with local leaders about health care and preserving the ACA, leaders of the protests said. Simultaneously, Save My Care, which organized the rallies and is sponsoring the bus tour, launched radio ads against four GOP senators who voted to debate the Republicans’ health care legislation. Two of them – West Virginia’s Shelley Moore Capito and Nevada’s Dean Heller – had been considered undecided on repealing the ACA. The others are Cory Gardner of Colorado and Jeff Flake, McCain’s Arizona colleague. Heller and Flake face the voters next year, and rally organizers hope to capitalize on that. Eight years ago, a Democratic-run Congress wrangled over the ACA. Loud, obnoxious and threatening crowds – marshaled by right wingers and funded by behind-the-scenes billionaires—screamed against it at lawmakers’ events during the recess. The bullying forced every single Republican to oppose the ACA. Weingarten wants to make it clear that voters oppose the GOP health care schemes. The bus tour began in Los Angeles on July 29, just hours after Sen. John McCain, R-Ariz., who had traveled from his Phoenix hospital bed – where he’s undergoing treatment for a brain tumor – to D.C. to vote on health care, cast key votes to kill the Republicans’ alleged “replacement” for the ACA. 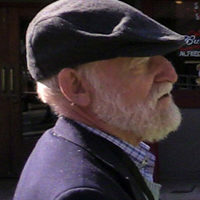 The bus reaches Phoenix on August 4 and Tucson the next day, tour organizers said. Besides Weingarten, other leaders of the bus tour include Sister Simone Campbell, director of the Catholic nuns’ lobby group Network. They marshaled signatures from 7,100 nuns for the ACA on moral grounds. “The bus will carry progressive leaders from many groups to speak out at each stop against the GOP health-care plans,” organizers said, as they know – and fear – that not only could the Republicans try again to kill the ACA in Congress, but that the GOP Trump government is trying to dismantle it administratively.